The purpose of this web page is to providing information concerning our winter home and place of business Slab City USA. We have spent winters here since 1985, enjoying the mild winter climate of the Southern California Desert. This is a quiet ad hoc desert community with winter daytime temperatures averaging somewhere in the high seventies and very little rain. Although the mild climate originally brought us here it is the wonderful, adventurous, creative full of life, people, that keeps bringing us back year after year. Slab City is located in Imperial County, in South Eastern California , about two and one half miles East of the Town of Niland. From hwy. 111 you turn on Main St. East. After the railroad tracks Main St. seamlessly changes to Beal Rd. as you drive towards the Chocolate Mountains in the eastern horizon. After about 2.5 miles you can't help but look toward the right and admire and wonder at the sight of Salvation Mountain. Over the years since we began coming to southern California we have watched Leonard Knight transform this desert hillside into a beautifully creative painted testament of his devotion and creativity. Salvation Mountain has been designated a national monument because of the hard work and devotion of Leonard Knight but if you stop and talk or take pictures you are likely to meet a man that is enthusiastic about his work but humble and mild mannered with his visitors concerning his accomplishments. For the most part Leonard lets his mountain of painted sand and clay do his talking for him. When you stop and admire Salvation Mountain you automatically wonder at what one man, a dream, coupled with faith and devotion, can accomplish. A few hundred yards past Salvation Mountain up a slight rise on Beal Rd you get a better look at the creative campsites of this low desert community. You will see all kinds of desert living here. Some people have tents, converted busses, trailers, campers, motor homes, I know one person who made a temporary swimming pool in a dry wash. One of the nice things about this place is that as long as you are not bothering your neighbors you can park and set up your desert camp anywhere. Once you are here stop, rest, and get to know your neighbor. They are likely to have a lot of adventures to share. Good chance they will share their interests and maybe by a camp fire. Who knows maybe a guitar will show up with some one behind it playing and singing music. You will not only be likely to find the kind of music and entertainment you like but in the winter lots of other activities are available. I know people playing cribbage, Poker, dominos, stained glass, paintings, line dancing, clog dancing, and a couple of regulars have ultra light planes they fly over the desert on calm days. If you are a single person, woman or man, one of several singles clubs might interest you. These clubs offer all sorts of opportunities for people to get to know and enjoy each others special interests. Off shoots of these clubs also get together and enjoy activities such as off road vehicle tours in the desert. Some of the non club sponsored activities a t Slab City include weekly non denominational worship each Sunday. Preacher Phil also has a social hour with singing and refreshments each Friday evening around a camp fire. Builder Bill this last year began what he calls The Range with live entertainment by local entertainers sundown each Saturday. Both these activities have been well attended. Each year in January , the last Sat. in January, we sponsor the Annual Solar Potluck and Talent Show. This event has been growing each year with lots of great food and local talent. This year we will celebrate the Tenth Annual Solar Potluck and Talent Show the last Saturday in January the 25th. So if you are in the neighborhood, and see the lights on, swing on by Slab City USA. Maybe you can contribute some of your ideas and talent while enjoying this great desert community. 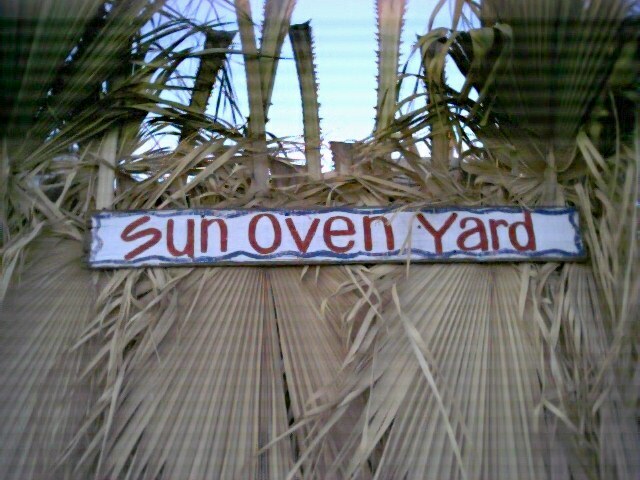 This is a sign we put up for our Solar Cooking area. 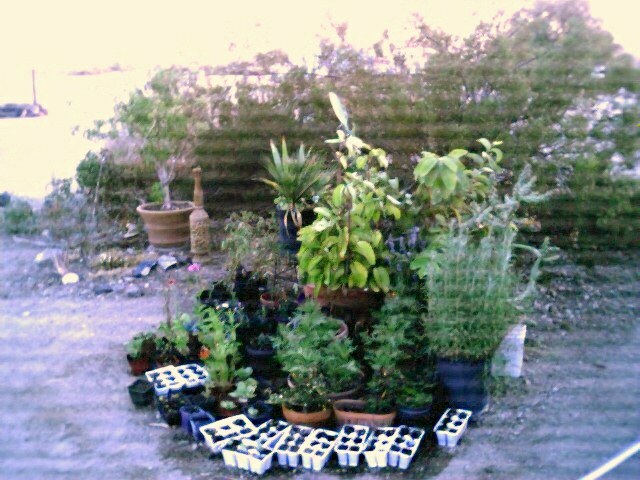 A section of our Winter Garden at the Slabs. 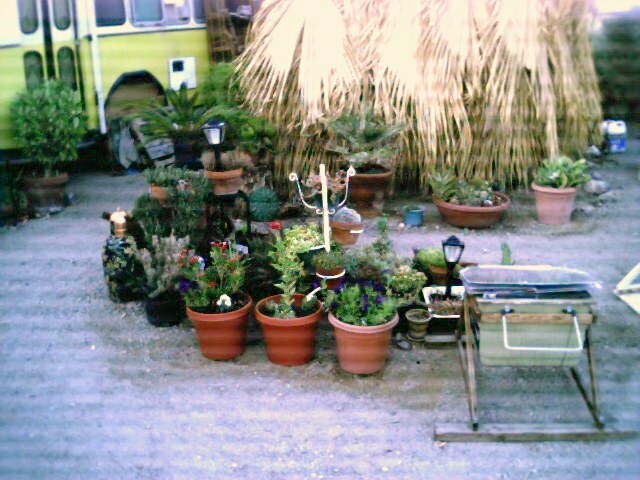 A section of our Winter Garden Slab City.